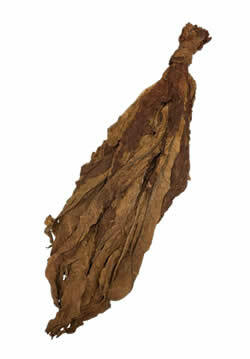 The Fronto / Dark Air Cured (J1) is often a very dark, very thick air cured tobacco leaf. The J1 Grade name signifies that it was grown southwest of Louisville, in Kentucky, USA. This leaf is often one of the largest, and one of the darkest leaves we carry, but as with any natural leaf, this can vary slightly. This leaf has a very dark chocolate brown color on top, with a lighter color on the underneath. Due to its large size, it is to be expected that there will be slightly more damages than other Dark Air Cured. Dark Air Cured Fronto Leaf [J1] is one of many kinds of fronto leaf that is also called Grabba, Red Rose, Red Leaf, Fronto, Funta… the leaves are dark & thick and commonly used for crushing or blending as a grabba leaf [popular in the Caribbean]. These dark air cured fronto leaves provide a bold smoke that grabba leaf smoker’s would refer to as ‘hot’ or having a strong ‘hit’. This type of leaf is commonly sold either by the leaf, or by the pound in many stores. Although primarily used to mix with, it is also possible to roll with some of the thinner varieties of dark air cured fronto leaf. These Dark Air Cured Fronto leaves harvested fresh from the farm! Fronto leaves are thick, easy to handle, and are great as “roll your own” tobacco. This Fronto leaf is also called grabba leaf, which is famous for it’s strong / bold flavor profile. Despite the thickness and strength of this tobacco leaf, it burns evenly, tastes smooth and produces a clean ash. Dark Air Cured Fronto is for tobacco enthusiasts with an acquired taste. Popular in Jamaica and the Caribbean! * Dark Air Cured Fronto is unrefined, meaning that some leaves have imperfections such as holes, torn strips, and discolorations. Interested in purchasing a quantity of Dark Air Cured Fronto Leaf [J1] at the incredible prices listed below? Contact us at 1.802.776.8983 to set up your order today! 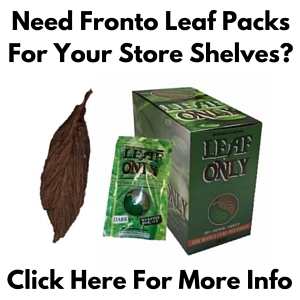 We have every kind of fronto leaf tobacco known to mankind... and plenty of it! QB52 is one of most sought after kinds of fronto leaf in New York City! It is considered to be a medium darkness wrapper grade leaf. This leaf has been aged MUCH longer than the regular QB-52 Fronto Wrapper, to make it a beautiful dark chocolate brown color. QB52 Fronto Dark is a darker version of the standard QB52, and is an excellent wrapper grade leaf for those who prefer a bit stronger / bolder smoke. The QB52 Fronto Leaf (L) is a slightly darker version of the standard QB52 tobacco leaf, but it's mostly used for 'grabba' because most of it is not wrapper grade. 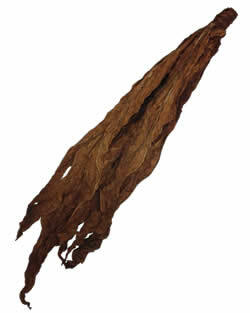 Connecticut Fronto is known for higher quality, and is normally used as a high grade cigar wrapper leaf. This grade of Connecticut Fronto leaf is grown from a havana seed and has a comparable consistency to the CT Fronto Leaf [M-27], but the Havana seed it is grown from gives it a slightly different flavor profile. This variety of Dark Air Cured Fronto is excellent for use cigar binder & filler. It has dark & strong properties that make it ideal for Grabba Leaf use. 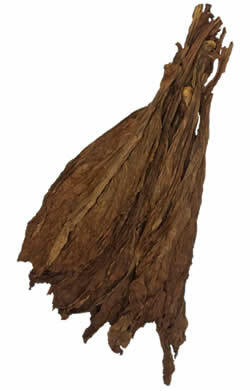 This kind of Dark Air Cured Fronto leaf is very similar to the Dark Air Cured (GR), except that they are a bit milder. Great for use as cigar binder & filler! This fronto leaf is grown in Canada, and is a high quality cigar wrapper leaf that can also be used for cigar binder. It is larger in size, but lighter than the Dark Air Cured (GR) & (ALO). The Dark Air Cured Fronto Leaf [H] is a higher quality, sorted version of our Dark Air Cured Fronto Leaf [CLO] that has a consistent milk chocolate brown color throughout each bundle. 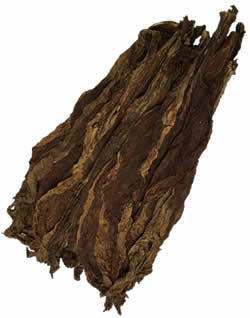 The Fronto / Dark Air Cured (J1) is often a very dark, very thick air cured tobacco leaf that was grown southwest of Louisville, in Kentucky, USA. This leaf is often one of the largest, and one of the darkest leaves we carry! The dark air cured tobacco leaf has a bold and beautiful dark color like a maduro leaf, and it has unforgettable dark red and brown tones which will darken more over time. These dark air cured fronto leaves are aged and have become darker and more chocolate in color over time. 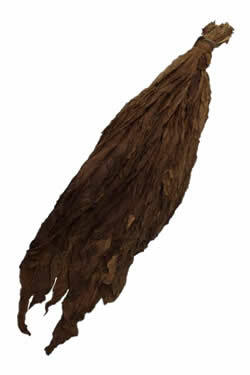 Dark air cured tobacco leaves are similar to what is used in the Caribbean. These kind of dark air cured fronto is truly aged to perfection, and have become super chocolatey in color. Not 100% wrapper, but excellent for use as 'grabba'. The Dominican Fronto Leaf varies in color, but is generally a darker leaf with smooth to medium strength and small veins. Classic Dominican flavor! One of the darkest varieties of fronto that money can buy! It has a pungent, smoky flavor from the famous fire curing process. Very large & thick leaves! A mellower, lighter version of the fire cured fronto leaf. It has many uses besides cigar rolling / smoking, such as chewing tobacco & snuff making.